Chorsolisten der Komischen Oper Berlin, Orchester der Komischen Oper Berlin / Henrik Nánási. Stage director – Barrie Kosky. Komische Oper, Berlin, Germany. Friday, February 26th, 2016. In common with last night’s Stiffelio, Barrie Kosky’s new production of Yevgeny Onegin was premiered on January 31st this year. Under his direction the Komische Oper is flourishing. He has programmed a stimulating variety of operas and musicals (including Kiss me Kate and West Side Story) and the performance the house forces gave of Moses und Aron was one of the highlights of 2015. The house was full tonight and there was a positive atmosphere and a welcome mix of ages in the audience. Another extremely welcome innovation Kosky has introduced is to abandon the Komische’s previous German-only policy and seat-back titles have been made available in four languages (German, English, French and Turkish). Indeed, one really starts to wonder whether London could use a visionary such as Kosky to turn ENO around. What really struck me tonight was the quality of the diction. While I don’t speak Russian, one could really hear that the cast had worked hard at adopting those particular Russian diphthongs and consonants. This was a performance that lived through the text and what also struck me as the Komische chorus sang their opening number was the depth and richness of the choral sound – it sounded like it was coming from the very heart of Russia. 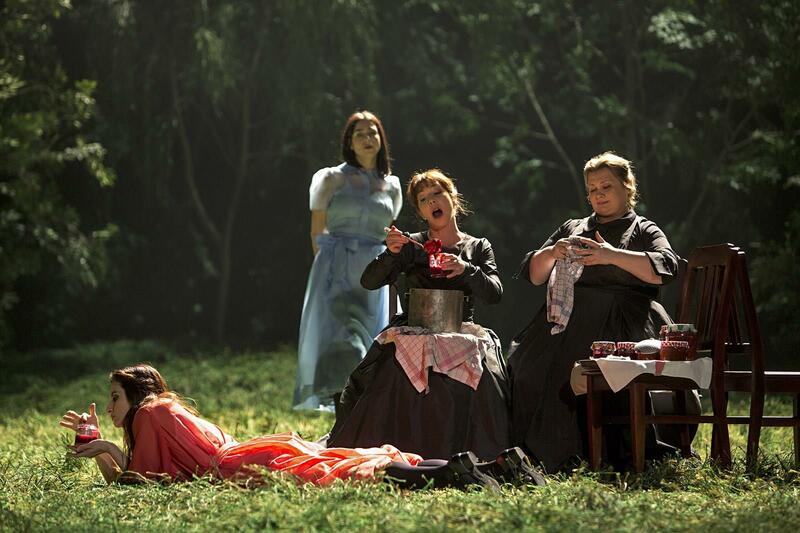 In contrast with Warlikowski’s deeply moving Munich production which focused on Onegin and Lensky, it seems that for Kosky, the opera is very much about Asmik Grigorian’s Tatyana, with an equally moving outcome. She is central to the piece appearing at points where we don’t normally see her: after the duel (which takes place off-stage) Tatyana returns while Onegin reappears with a bloodied shirt and announces ‘dead’ taking Zaretzky’s line as well. Indeed, much takes place out of sight – the polonaise is played with the curtain down, the cotillion in the name-day party takes place off-stage while individuals are left alone in their musings. In that respect, this is very much a staging about not fitting into society and about being alone with one’s thoughts. This I found a highly cogent and compelling reading, one also aided by the excellent lighting by Franck Evin. 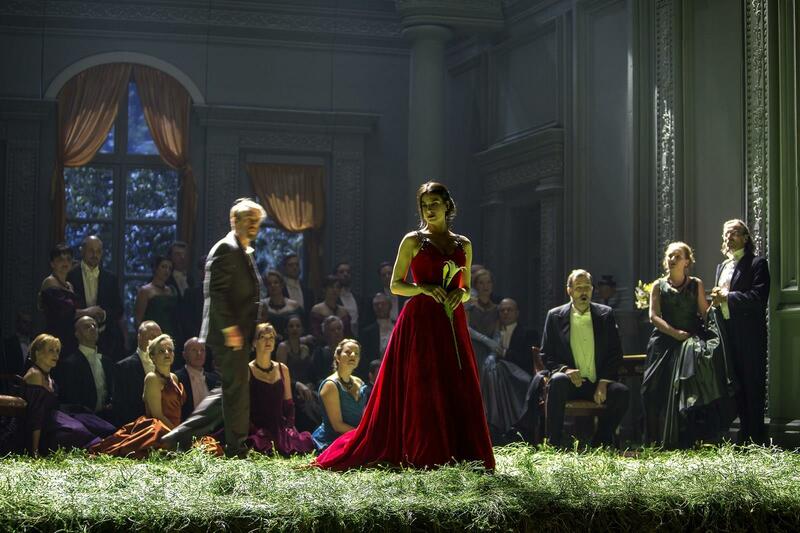 In the letter scene, Tatyana stands at the front of the stage, alone and spot lit. As she sings ‘who are you? My guardian angel or a tempter’, her inner thoughts coming to the fore, Grigorian is barely lit and Henrik Nánási chose a daringly slow tempo. In that very moment the devastating loneliness of Tchaikovsky’s writing emerged in the most heartbreaking way, aided by Grigorian being absolutely bang in tune. Also in contrast with many interpreters of the role, Grigorian ideally incarnates both the bookish schoolgirl and the mature princess, here an elegant and confident society hostess. 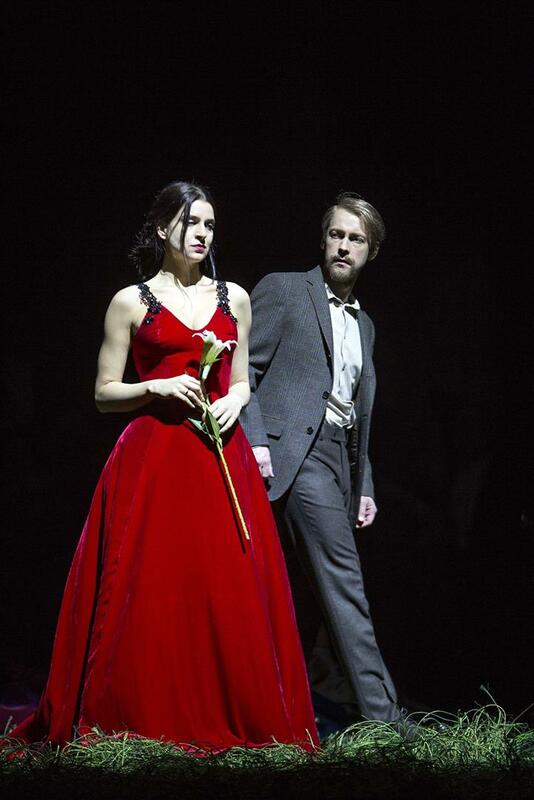 Perhaps inevitably with the focus on Tatyana, much less is made of Onegin than in other productions. Tonight, Onegin didn’t actually sing until the quartet – I’m not sure if this was a missed call or whether it was in fact part of the Regie, but it reinforced the sense of him being less of a concrete personality than one normally sees, certainly combined with the fact that so much action takes place off stage. 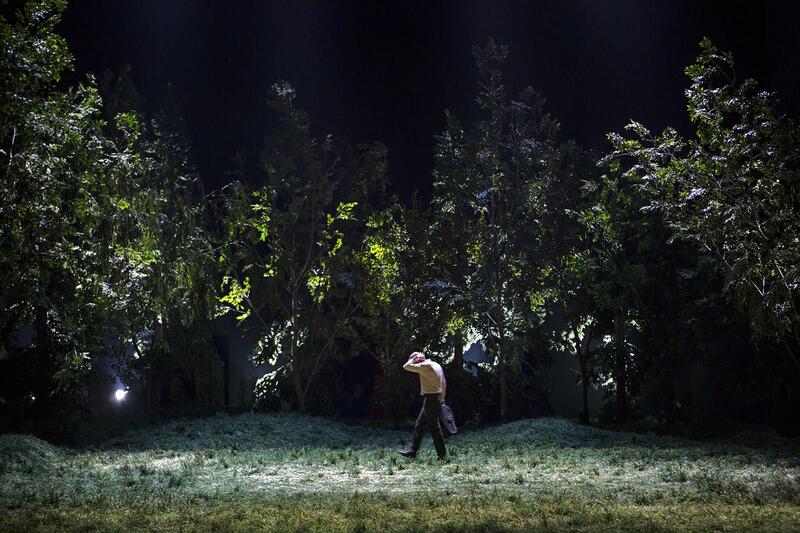 The sets (Rebecca Ringst), place most of the action in a field surrounded by a forest with the sole exception being the Gremins’ party taking place in an apartment built inside the field. 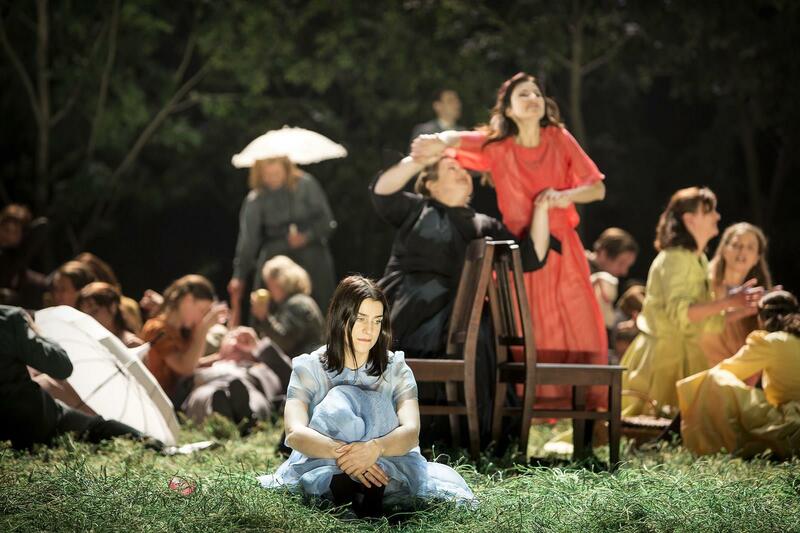 As Onegin comes to realize his mistake in rejecting Tatyana, the apartment is dismantled and the final scene plays out in the field in a rainstorm. Musically, there was much that was really impressive. Grigorian struck me as an ideal Tatyana. The Lithuanian soprano has a metallic core to the sound that is remarkable to listen to but she also softens it beautifully where required. Her letter scene was thrillingly sung – in those 15 minutes or so, she completely encapsulated all of Tatyana’s emotions and she soared gloriously in the final scene. The voice is a good size and her tuning was impeccable. Günter Papendell was also a very fine Onegin. Sung with handsome tone he had clearly worked very hard on the language and sounded, to my ears at least, extremely convincing. He has a good line and a warm, beguiling tone. He also had the strength for the final scene blending wonderfully with Grigorian. Aleš Briscein sang Lensky with real poetry finding genuine stillness in ‘kuda, kuda?. His tone is bright and penetrating with perhaps a limited range of colours but he used dynamics appropriately to shade the music. What was an issue was his intonation and he was unfortunately under the note far too often. In the supporting cast, Karolina Gumos was a vivacious Olga, her fizzy mezzo stretched somewhat by the low tessitura but she was an engaging stage presence nonetheless. Christiane Oertel’s Larina was wide of vibrato and somewhat raw of tone but she was also a positive presence on stage. Margarita Nekrasova sang Filippyevna with a fabulously fruity contralto that is in good shape and much more satisfying that some of the superannuated singers often cast in that role. Alexey Antonov perhaps lacked the ultimate depth of tone for Gremin, his was a lighter more grainy sound, but he certainly had the notes. The Komische’s chorus was respectable although some of the ladies had a tendency to wobble. Unfortunately, the intonation in the strings was poor, particularly in the cellos but the winds played very well. Nánási’s conducting was excellent, the dances fleet of foot, the heartbreak of the story wonderfully brought out by an intelligent use of rubato and dynamics. He really knew when to pull the sound back and when to let it bloom. Unfortunately, the waltz was ruined by Kosky’s decision to get the chorus to ululate while they indulged in stage business and the polonaise was ruined by the Berlin audience taking the curtain down as an invitation to chat to their neighbours. After seeing that unforgettable Onegin in Munich last summer, I didn’t expect to see one so deeply moving quite so soon. Yes there are issues with this production – Onegin not being as well-developed as he could be, the intonation problems I mentioned above – but it was a spellbinding exploration of the loneliness of desire, one that I found extremely moving due to a mesmerizing performance of the leading lady by an extremely talented singer-actress. 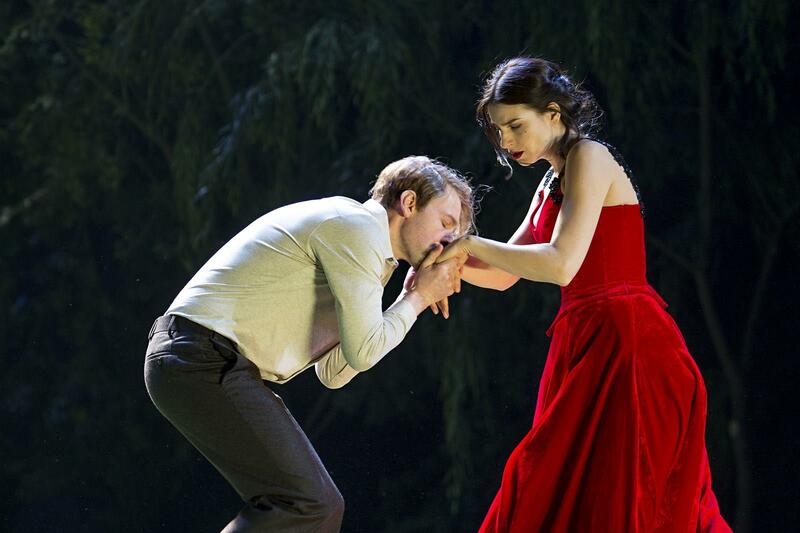 It is without doubt an Onegin worth seeing and in fact you can do so thanks to the Opera Platform where the show is available to watch online until August 2016.